Thank you Shirley, appreciate your work and generosity. Thanks for this lovely and useful file. Merci Shirley pour ce nouveau partage et magnifique fichier. De la neige en Suisse. Cordialement. Thank you for the great design. It reminds me of stained glass. Hi Shirley a rare visit on the 'puter and I find this fabulous card. Thank you so much. Enjoy your holiday from the chilly UK. Oh thank you really nice design thank you for your sharing with us....always always love your cards. Perfect timing, as usual you get me inspired and moving. Thanks and enjoy your holiday. Thank you, once again for sharing your fantastic files! Have a lovely break and try bringing some sunshine back too Shirley. Many thanks Shirley. Have a great holiday. 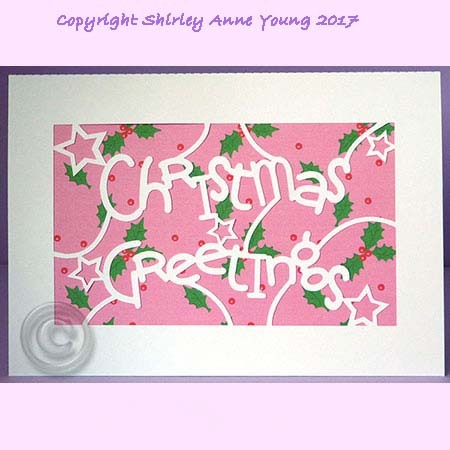 Thank you, Shirley, for another pretty Christmas card. Enjoy your sunshine holiday away! Shirley, thanks so much for the beautiful card.